St. Martin's Griffin, 9781250067821, 224pp. 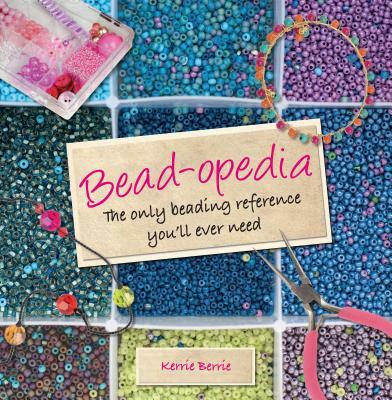 Bead-opedia is a concise yet comprehensive guide to all things related to the craft of beading. Covering the basics, plus intermediate and more advanced beading and knotting techniques, this book will give you the know-how you need to create jewelry and accessories you'll love to make and wear. With step-by-step instructions and clear images, it will help you easily pick up new techniques and master the ones you've developed. Also included are 25 inspiring and fresh projects that utilize the latest and most popular beading techniques, including macrame, soutache, wire crochet, and many simpler techniques, like how to tie a double knot on elastic. Bead-opedia will provide you with the knowledge and confidence you'll need to experiment with new ideas, and by working your way through these techniques and projects, you'll be well on your way to creating your own beautiful jewelry. KERRIE BERRIE first started making jewelry over 15 years ago. In this book she collates her wealth of experience experimenting with new techniques and passing them on to beaders of all skill levels. Kerrie teaches beading workshops from her eponymous store. She lives in the UK.